In both my jobs, I work freelance, which means that on Sunday night, the upcoming week on the calendar looks one way and by Tuesday night all the little blocks are filled, scratches and arrows everywhere. By Wednesday morning one side of the fridge (B. has an aversion for magnets and other knickknacks on the front) is completely covered with "production sheets" such as menus, sitting charts,plating,order forms, invoices,.... One could say that my fridge is my office. Where am I going with this? On Sunday night I looked at the calendar and thought this week would be nothing as busy as the week before, which left me a little uncomfortable. I get paid by the event, the gig, the class, the training, which means that a slow week gives me some rest but does not help the pocket book. I admit, I needed a break, it helps regenerate the creative juices and there are a ton of household things awaiting my attention. I am also trying for some extra greens as I have a certain VIB (Very Important Blogger) coming to visit in a few weeks and I want to be free to spend on foods and shopping while she is here. I looked at the schedule and said out loud "now is when I need that one easy high paying dinner party...Oh a girl can dream!" That sort of things never happen to me usually, well, maybe once or twice, like when Andie McDowell had dinner at the restaurant and left the staff a huge tip for the "exquisite" (her words) meal she had...and that was years ago! Let me tell you, men and women alike in the restaurant were in awe of her beauty...gosh that hair!! 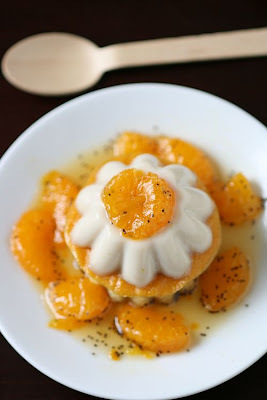 Anyway,back to this Coconut Pana Cotta-Warm Lemon Poppy Seed Cake and Yuzu Mandarin Sauce. Quite a long title I know, and not something I would make for us during the week unless I were working on a project, which I was by Monday night. I got a call from one of my favorite clients who decided to celebrate his and his wife 25th wedding anniversary with a dinner for 30 under the theme "East Meets West", as he is American and she is Vietnamese, and would I want to take care of the desserts? I love working at their house, big, equipped to the ceiling, modern yet cozy and rarely used because they eat out more than anything. They are also very generous and fun which made me look at the sky, say "Thank you Big Guy" and promptly accept. Two minutes afterwards, I started getting a little anxious: I don't know that much about Asian desserts, I read a lot of Asian blogs, I know Asian flavors but I had to incorporate Eastern ones with it, and hopefully do it tastefully. Instead of marrying one dessert of each continent on a plate and hope for the best, I drew my inspiration from flavors and textures. What you see in this pictures is what will be served Friday night and after the initial test run with B., the client, and the other chef working the main, I think we are on track. If I could put my hands on fairy floss, I would use it to decorate the top of the panna cotta but no such luck here. You can make all the elements separately and eat them as such, and although it seems like a lot to do for desserts, they come together quickly and you can spread your work over a couple of days if you want. The pana cotta is a cinch to make and I let the coconut milk infuse with a bag of white tea for extra flavor and one chopped lemongrass stalk. The lemon poppy seed cake is made with a mix of all purpose flour and semolina which gives it a nice crunchy bite. The sauce is puckery and sweet at the same time with extra poppy seeds which soaks into the warm cake making sure you get a soft bite and not a mouth full of cake against the panna cotta. Yuzu juice is not difficult to find online and goes a long way but you can substitute a mix of lemon and lime juice for it. If you want to read more about Yuzu, go check the article Kalyn wrote for Blogher a couple of days ago. The panna cotta rests on a peach chip since I had leftover peach puree from the peach ganache for the macarons I made the other day. For the technique to make fruit chips, read this post where I made raspberry one the exact same way. Combine all the ingredients, except the gelatin, in a saucepan over medium high heat and bring to a boil. Remove from the heat and let the cream to steep for 20 minutes. Pass the mixture through a sieve or a chinois, heat the gelatin in the microwave for 15 seconds and quickly stir it in the cream mixture. Divide it evenly among small dishes (I used brioches molds). Refrigerate and allow to set at least 3 hours or overnight. To unmold, dip the bottoms in hot water for a minute and invert to unmold onto a piece or parchment paper, they will be easier to scoop. Preheat oven to 300F. In a bowl, combine all the ingredients for the cake, except the butter. Mix with a whisk until smooth. Add the butter and nix until it all comes together. Pour the batter into 8 small buttered molds, or 3 inch metal tart shells. I used scalloped silicone cake forms. Bake for 20 minutes or until a knife inserted in the center comes back clean. To reheat before serving, pop them in the microwave or back at 300F for 5 minutes. Combine all the ingredients in a saucepan and bring to a boil. Boil for 10-15 seconds and remove from the heat. Add the mandarin sections. Use at once. Make it at the last minute and serve it hot with the dessert so that you get a wide spectrum of temperature. 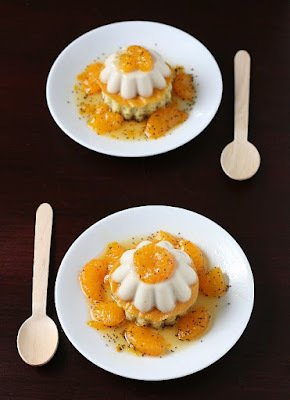 Pour some sauce at the bottom of each plate, place a warm cake in the center, top with a peach chip, top with a pana cotta and decorate with a mandarin section if desired. See, it looks a lot more labor intensive than it really is, which works great for me when I make 30 for my client's "intimate dinner" (!) or 8 for us and a few friends. Ok, so next post will be cupcakes...just because I don't want to scare you away!! Helen, you never cease to amaze! Incredible colors, and textures I'm sure, what a creative dessert! You were able to get your hands on some yuzu! Lucky you! I thought about ordering it online when I made the opera but I didn't. I bet this tastes amazing!!! 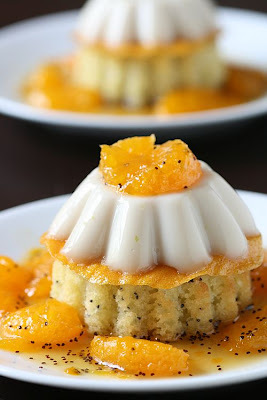 You definitely (and unsurprisingly) persevered through the challenge with trying to make an Asian dessert - that Coconut Panna Cotta-Warm Lemon Poppy Seed Cake & Yuzu Mandarin Sauce (quite a title, indeed, haha!) looks SPECTACULAR. Bravo, Helen! What a gorgeous combination, your client is so lucky! It does look rather involved, but you did a nice job with it. All of the parts look like they'd be appetizing enough to eat on their own! This is such a stunning dessert! And what a fun job you have. I have always thought that I wouldn't want to work in the food business because the idea of making the same thing over and over doesn't appeal to me. But your job would be so fun - you get to be so creative!! this is beautiful! I love east meet west kind of desserts, so this is right up my alley. 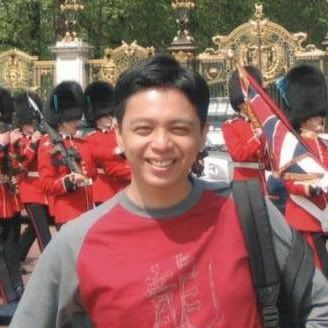 Your posts are always so inspiring to read and make me want to be more daring and adventurous. Thanks for the interesting writing too...so much fun! I love making panna cotta - and I really like the idea of making it in a brioche mold instead of the usual ramekins I use now! Deborah: gigs like that are the fun ones, the ones I get about one time a week usually but the "normal" ones are more like cakes and cupcakes of all sorts. I agree though, these are those I want everyday!! you have such a fabulous blog...i am totally and utterly in AWE of your photos which are so beautiful the way they are lit, laid out and vivid with colours. amazing! You my dear, are amazing! My hero even! You have such inspiring posts! Thank you for the comments to my blog. It really made me smile. Maybe someday we can meet and chat. I think we would have a LOT of fun! When I saw these photos on Flickr, I thought WOW!! Would love to have this as dessert! Way to blend East meets West. It turned out beautiful...as if there were every any doubt. You truly are an inspiration. You also make it seem quite easy, when I imagine it isn't. Love the colors, textures and presentation. Bravo! Love the spring colors. Panacotta is one of my favorites. After reading Kalyn's post and now yours, I really have to learn more about yuzu. My those do look lovely! I hope your clients were as impressed as the rest of us are! looks amazing...can't wait to try this! 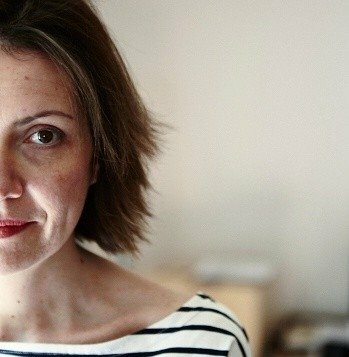 I just found your blog through flickr...I'm adding you to my blogroll at www.moderngirlskitchen.com and hope you will come visit!!!! I'm so glad to have found your blog!!!!!! Coconut Panna Cotta! Wow. This is amazing. Isn't that beautiful? You are amazing and I love how creative your combination of flavors is. That just looks exquisite to me. WOW, as always you have out done yourself. Pure inspiration! WOW incredible! Where do you get your Yuzu juice from? I can't even imagine hand-squeezing 1/2 from those little things and the bottled stuff they have at Japanese groceries has salt in it. Now THAT sounds just perfect! I'd take the white tea and lemongrass flavoured coconut panna cotta right away, but the whole dessert seems quite out of this world! Mmmm, I love yuzu anything! I love how versatile it is. They have a condiment here in Japan made partially from yuzu, that is a little like wasabi, quite spicy, but with more flavor. I am not a big panna cotta or coconut fan, but that looks like sunshine on a plate. I would taste that dessert for it's beauty and the other flavours you added. Just a joy to look at. Ooh, I can just imagine all of those juices soaking into the cake. Great textures too. I'd like to taste yuzu !! This recipe seems wonderful ! What a wonderful twist on the panna cotta, Helen! And you and Marce will have so much fun together, yay! Superbe! J'adore la teinte générale orange dégradée en plusieurs tons. J'aime aussi l'association des différentes textures et saveurs. C'est un dessert très original! Je savais que le yuzu est très difficilement trouvable en-dehors des endroits où il pousse, mais tu m'as appris quelque chose concernant la disponibilité de son jus sur internet! This a great east meets west dessert. the combination of flavors is fun and creative. c'est manifique! MMMMmmmmmmm and looks tasty too. Brilliant... creative genious. I love to see what you are up to and I am always glad I did. Thank you for your comments on my blog and I do hope you get your pasta machine. Love the combination and looks! Love your new banner too. This is truly stunning! A piece of art. I adore pana cotta - but wow - when done in this way, it looks truly divine. Beautiful. this looks amazing helen. I love the different flavors and textures here. a fantastic dessert! Great flavor combination Tartelette! I bet the party guests were all saying "ooh la la"!! Sweetie, this is definitely going to be a hit at the party. Oh and my comments are fixed now, thanks again for letting me know! You have outdone yourself with this one. What a gorgeous dessert! This looks lovely! Definately worth the extra work! That looks fantastic and I'm sure your clients will love it--I definitely would! aha effectivement, encore fois sur la meme longueur d'onde. C'est marrant. Tres joli dessert, par ailleurs. these are islands of pure goodness!! please send me one! You continue to amaze me with your beautiful photography and to-die-for desserts. Simply stunning. Oh my God! This is love at first sight! Beautiful. I just had a yuzu tart last night for dinner out at Chicago's Sola restaurant (one of my favorites in the city). It was sublime. It is great to see this eastern flavor may be taking off. And I love the way you paired it with coconut and tea infusion. This is a mouthwatering creation. I love panna cotta but my one critisism is that it always looks the same. This doesn't though - well done! I'd pay serious money for that dessert... what a fabulous blend of tastes, textures, and colour. Helene, you are an inspiration! These sound sensational.